본 발명은 면적이 적어 고집적화가 가능하고, 프로그램 및 소거 시에 워드라인에 전달되는 포지티브 또는 네가티브 고전압(VPP, -VPP)의 펌핑 시간을 단축시키는 플래쉬 메모리 장치의 로우디코더를 제공하고자 하는 것으로, 이를 위하여 본 발명의 플래쉬 메모리 장치의 로우디코더는 다수의 워드라인으로 이루어진 워드라인 블록을 선택하기 위하여, 제1 및 제2 글로벌 워드라인 신호를 출력하는 글로벌 로우디코더; That the present invention is to provide a row decoder for a flash memory device, which area is less high integration is possible, and shorten the pumping time of the positive or negative high voltage (VPP, -VPP) are passed to the word line during the program and erase, it a global row decoder for the row decoder of the flash memory device of the present invention to select a word line block consisting of a plurality of word lines, the first and outputs the second global word line signal to; 및 상기 글로벌 로우디코더에 의해 선택된 워드라인 블록의 어느한 워드라인을 선택하기 위하여, 상기 제1 및 제2 글로벌 워드라인 신호에 응답하여 구동하는 로컬 로우디코더를 포함하여 이루어진다. And to select any one of word lines of word line block selected by the global row decoder, it comprise the local row decoder for driving the first and second response to the global word line signal. 본 발명은 플래쉬 메모리 장치(Flash Memory Device)에서의 로우디코더(Row Decoder)에 관한 것으로, 특히 로우디코더의 면적을 최소화하면서 프로그램(Program)시 워드라인(Word-Line, WL)에 공급전압(VCC) 이상의 고전압(VPP, 이하 VPP라 칭한다)을 공급하기 위한 전압 펌핑(Pumping) 시간을 줄일 수 있도록 고전압용 소자가 형성되는 웰의 로딩을 줄일 수 있는 플래쉬 메모리 장치에서의 로우디코더에 관한 것이다. The present invention is a flash memory device (Flash Memory Device) The row decoder (Row Decoder), and more particularly, minimizing the area of ​​the row decoder program (Program) when the word line (Word-Line, WL) supply voltage (VCC to about at ) is more related to the row decoder in the high voltage (VPP, hereinafter referred to as VPP) with a high-voltage element to reduce the voltage pump (pumping) time to reduce the loading of the wells to be formed for supplying the flash memory device. 통상적으로, 플래쉬 메모리 장치는 섹터(Sector) 단위로 소거(Erase)를 실시하고, 바이트(Byte) 단위로 프로그램을 실시하므로, 선택된 섹터의 셀(Cell)들을 소거할 때에는 비선택된 섹터들의 셀들은 소거가 되지 않아야 하고, 선택된 셀을 프로그램할 때에는 비선택된 셀들은 프로그램되지 않아야 한다. Typically, the flash memory device is a sector (Sector) performs erasure (Erase) as a unit, and so carry out a program in units of byte (Byte), the time to erase the cell (Cell) of the selected sector cells of the non-selected sector are erased It should not be, and should be non-selected cells are not programmed when you program the selected cell. 상기와 같은 이유로 플래쉬 메모리에서는 섹터 단위로 메모리 어레이(Memory Array)를 블록킹(Blocking) 하여야 하며, 섹터 단위로 메모리 어레이를 블록킹 하였다 하더라도, 바이트 프로그램시에 하나의 워드라인에 연결되면서 비선택된 셀들은 게이트 스트레스(Gate Stress)를 받게 되며, 하나의 비트라인(Bit-Line, BL)에 연결되면서 비선택된 셀들은 드레인 스트레스(Drain Stress)를 받게 된다. It should be a flash memory in a blocking (Blocking) a memory array (Memory Array) on a sector-by-sector basis reasons described above, even if we block the memory array on a sector-by-sector basis, while connected to a word line at the time of byte program unselected cells are gate stressed (Gate stress), and, while connected to a bit line (bit-line, BL) non-selected cells are subjected to stress the drain (drain stress). 일반적으로 게이트 스트레스가 드레인 스트레스 보다 셀에 미치는 영향이 10배정도 크다는 것을 알고 있으면서도, 하나의 워드라인에 연결된 셀의 수가 하나의 비트라인에 연결된 셀의 수 보다도 많도록 셀 어레이를 구현하는 이유는 로우디코더의 면적이 크기 때문이다. The reason for generally gate stress implements the number of cells than the cells to many array number of connected to one bit line of the cell connected to one of word lines yet know that the larger 10-fold effect on the cells than the drain stress row decoder because the area size. 또한, 플래쉬 메모리에서의 로우디코더는 각 동작 모드 별로 워드라인에 가해는 전압레벨을 상이하게 하여야 하는데, 선택된 워드라인에는 기입(Read)시 공급전압(VCC, 이하 VCC라 칭한다)을 공급하여야 하고, 프로그램시 VPP를 공급하여야 하며, 소거시 네가티브(Negative) 고전압(이하, -VPP라 칭한다)을 공급하여야 한다. Further, the row decoder in the flash memory to be supplied to the to be made different to the voltage level applied to the word line for each mode of operation, the selected word line, the write (Read) for supply voltage (VCC, hereinafter referred to as VCC), when VPP to be supplied to the program, and to be supplied to a negative (negative) high-voltage (hereinafter referred to as -VPP) during erase. 그리고 비선택된 워드라인에는 각 모드시 모두 동일하게 접지전압(VSS, 이하 OV라 칭한다)을 공급하여야 한다. And non-selected word line are to be supplied to the same ground voltage (VSS, hereinafter referred to as OV) in full on each mode. 따라서, 회로가 복잡하고 면적도 많이 차지하게 된다. It is therefore the circuit is complicated and take up a lot of space. 도 1은 종래기술에 따른 플래쉬 메모리 장치의 로우디코더 회로도로서, 노드B 레벨에 응답하여 전원소스단인 VPPX의 레벨을 워드라인(WL)에 전달하는 피모스트랜지스터 hp3과, 노드 B의 레벨에 응답하여 전원소스단 VEEX의 레벨을 워드라인(WL)에 전달하는 엔모스트랜지스터 thn1을 구비하며, 상기 피모스트랜지스터 hp3은 VPPX에 기판이 접속되며, 상기 엔모스트랜지스터(thn1)는 트리플 웰(triple well)에 형성되면서 트리플 웰의 N-웰에는 VCC이 공급된다. 1 is a circuit diagram row decoder for a flash memory device according to the related art, PMOS transistor hp3 in response to the node B level to pass the level of the power source stage VPPX to a word line (WL) and, in response to the level of the node B and comprises an NMOS transistor thn1 for delivering the level of the power source stage VEEX to a word line (WL), the PMOS transistor hp3 is the substrate is connected to VPPX, the NMOS transistor (thn1) is a triple well (triple well ) the N- well of a triple well, the VCC is supplied as formed. 그리고, 노드 B에는 제어신호 XRST의 레벨에 응답하여 VPPX 레벨을 전달하는 피모스트랜지스터 hp1과, 로우프리디코더의 출력신호 XAPRED (XA 어드레스 조합)에 응답하여 로우 프리디코더의 출력신호 XBPRED (XB 어드레스 조합), XCPRED (XC 어드레스 조합) 및 SECT을 낸드조합한 노드 A의 신호 레벨을 전달하는 엔모스트랜지스터 hn1이 접속구성 된다. Then, the node B, in response to the level of the control signal XRST VPPX level of the transmission PMOS transistor hp1 and the output signal of the row predecoder output signal XAPRED (XA address combination) row predecoder responsive to the XBPRED (XB address combination ), is XCPRED (XC address combination) and the NMOS transistor to the hn1 SECT pass the signal level of the NAND combining a node a is connected configuration. 또한 노드 B에는 출력단(워드라인 WL)에 응답하여 VPPX의 레벨을 전달하는 피모스트랜지스터 hp2가 접속되어 워드라인(WL)에 안정된 전압레벨을 전달한다. In addition, node B has an output terminal (word line WL) is a PMOS transistor, in response to hp2 to pass the level of the VPPX connected to and delivers a stable voltage level to the word line (WL). 상기와 같은 구성을 갖는 종래의 로우디코더의 동작을 살펴본다. It looks at the behavior of the conventional row decoder having a configuration as described above. 아래 표 1은 종래 로우디코더에 대한 모드별 동작을 나타낸다. Table 1 below shows the specific mode operation of a conventional row decoder. 기입모드시, 워드라인(WL)이 비선택되는 경우에는 VPPX은 VCC이고 XRST 및 VEEX은 OV이다. If during the write mode, the word line (WL) which is non-selected, VPPX is VCC and XRST and VEEX is OV. 선택된 섹터이고 선택된 XBPRED 이며 선택된 XCPRED 이면 노드 A의 신호가 OV이고, 선택된 XAPRED이라면 노드 B는 OV가되어서 결국 워드라인(WL)은 VCC 레벨이 되어 선택된다. These sectors is selected, and a selected XBPRED XCPRED If the node A signal is OV, selected XAPRED If the Node B has to be OV (WL) after all word lines are selected and the VCC level. 그밖에 선택되지 않은 섹터, XCPRED 및 XBPRED의 노드 A는 VCC 레벨이 되고 비선택된 XAPRED는 OV가되어서 비선택된 워드라인(WL)은 OV가 된다. Other node A of the non-selected sectors, and XCPRED XBPRED becomes the VCC level, the unselected XAPRED be an OV unselected word line (WL) is the OV. 프로그램 모드시, 기입모드에서와 같이 선택된 로우디코더의 노드 B만이 OV이고, 그 이외는 VCC 레벨로 있다가 선택된 섹터의 VPPX와 XRST가 VPP 레벨로 스위칭되면서 선택된 워드라인은 VPP 레벨이 되고, 비선택된 워드라인은 OV가 된다. And the program mode, only the Node B of the selected row decoder, as in the write mode OV, otherwise the VPPX and XRST of the can to the VCC level selected sectors to be as switching to the VPP level, the selected word line VPP level, the unselected the word line is OV. 소거 모드시, XAPRED가 OV이므로 노드 B는 VPPX 레벨이 되고, 선택된 섹터의 VPPX 레벨은 2V 정도의 레벨이 되며, VEEX는 -VPP 레벨이 되어서 선택된 섹터의 모든 워드라인은 -VPP 레벨이 되고, 이외의 섹터의 워드라인은 모두 OV가 된다. Are the erase mode, since the OV XAPRED Node B VPPX level, VPPX level of the selected sector is the level of about 2V, VEEX is this not be the -VPP level all of the word lines of the selected sector is -VPP level, other than the word line of the sector is both OV. 상술한 바와 같은 종래의 로우디코더는 기입 모드시 워드라인이 선택되는 시간이 피모스트랜지스터 hp2의 사이즈(size)에 의하여 주로 결정되고, 비선택되는 시간도 트리플 N-웰안에 있는 엔모스트랜지스터 thn1의 사이즈에 의하여 주로 결정되어지며, 회로도 복잡하여 그만큼 면적을 많이 차지한다. Conventional row decoder as described above, the write mode, when a word line is selected and determined primarily by the size (size) of the PMOS transistor hp2 time, the NMOS transistor thn1 in the time that the non-selectivity of triple-well N- becomes is determined primarily by the size, the circuit complexity and so take up a lot of space. 또한, VPPX에 대한 로딩도 크므로 VCC로부터 VPP로 펌핑하는 시간이 많이 소요된다. Further, the loading on VPPX also takes a long time to pump from VCC it is larger as VPP. 본 발명은 면적이 적어 고집적화가 가능하고, 프로그램 및 소거 시에 워드라인에 전달되는 포지티브 또는 네가티브 고전압(VPP, -VPP)의 펌핑 시간을 단축시키는 플래쉬 메모리 장치의 로우디코더를 제공함을 그 목적으로 한다. The invention to provide a row decoder for a flash memory device, which area is less high integration is possible, and shorten the pumping time of the positive or negative high voltage (VPP, -VPP) are passed to the word line during the program and erase for that purpose . 상기 목적을 달성하기 위하여 본 발명은 다수의 워드라인으로 이루어진 워드라인 블록을 선택하기 위하여, 제1 및 제2 글로벌 워드라인 신호를 출력하는 글로벌 로우디코더; A global row decoder for the present invention in order to select a word line block consisting of a plurality of word lines, the first and outputs the second global word line signals in order to attain the object; 및 상기 글로벌 로우디코더에 의해 선택된 워드라인 블록의 어느한 워드라인을 선택하기 위하여, 상기 제1 및 제2 글로벌 워드라인 신호에 응답하여 구동하는 로컬 로우디코더를 포함하여 이루어진 플래쉬 메모리 장치의 로우디코더를 제공한다. And a row decoder for a flash memory device comprising an local row decoder for driving the first and second response to the global word line signal to select any one of word lines of word line block selected by the global row decoder to provide. 도 2는 본 발명의 일실시예에 따른 글로벌 로우디코더 회로도로서, 그 세부 구성을 살펴보면, 본 실시예에 따른 글로벌 로우디코더는 기입 및 프로그램 모드에서 선택된 글로벌 로우디코더에는 OV를 입력시키고 비선택된 글로벌 로우디코더에는 VCC 레벨을 입력시키며 소거 모드에서 모든 글로벌 로우디코더에 VCC 레벨을 입력시키기 위하여, 프리디코더로부터의 출력신호 XBPRED 및 XAPRED를 2입력으로하여 NAND 조합하는 NAND 게이트(21)와, 제어신호 RSTN 및 RSTP에 응답하여 상기 NAND 게이트(21)의 출력노드 C 레벨을 제1 글로벌 워드라인 GWLP으로 전달하는 전달게이트(22)와, 상기 전달게이트(22)의 출력신호 레벨에 응답하여 기입 및 프로그램 모드에서의 비선택된 제1 글로벌 워드라인 GWLP 및 소거 모드에서의 모든 제1글로벌 워드라인 GWLP으로 VPPGX 전압레벨을 전달 2 is a global row decoder circuit in accordance with one embodiment of the present invention, referring to its detailed configuration, the global row decoder according to this embodiment, the global row decoder selected in the write-in and the program mode, type OV and the unselected global row decoders, sikimyeo enter the VCC level so as to enter the VCC level to all of the global row decoder in an erase mode, and the NAND gate 21 to the output signal XBPRED and XAPRED from the pre-decoder as a second input to NAND combination of a control signal RSTN and in response to the RSTP in response to the output signal level of the transmission gate 22 and the transfer gate 22 to pass the output node C level of the NAND gate 21 in a first global word line GWLP in the writing and programming mode non-selected first global wordline all first pass VPPGX voltage level to the global word lines GWLP in GWLP and erase modes 기 위한 제1회로부(23)와, 상기 전달게이트(22)의 출력신호 레벨에 응답하여 VPPGX의 전압레벨 또는 VEEGX의 전압레벨을 제2 글로벌 워드라인 GWLN에 전달하는 제2회로부(24)로 구성된다. It consists of a first circuit 23 and second circuit 24 for passing the voltage level or VEEGX voltage level of the VPPGX in response to the output signal level of the transfer gate 22 to the second global word line GWLN for group do. 좀더 구체적으로 도 2의 구성을 살펴본다. More specifically also look at the structure of the two. 상기 제1회로부(23)는 상기 전달게이트(22)의 출력에 응답하여 VPPGX 레벨을 전달하는 엔모스트랜지스터 hn22와, 상기 전달게이트(22)의 출력에 응답하여 접지레벨(OV)을 전달하는 피모스트랜지스터 hp22, 및 상기 엔모스트랜지스터 hn22 및 피모스트랜지스터 hp22으로부터 전달된 전압레벨에 응답하여 VPPGX의 레벨을 제1 글로벌 워드라인 GWLP으로 전달하는 피모스트랜지스터 hp23으로 구성된다. The first circuit 23 is the blood to pass the ground level (OV) in response to an output of the transmission gate 22, NMOS and the transistors hn22, in response to the output delivered to VPPGX level of the transfer gate 22 MOS transistor is hp22, and the NMOS transistor and PMOS hn22 configuration the level of VPPGX to the response to the voltage level delivered from the transistor hp22 with hp23 PMOS transistor passing a first global word line GWLP. 그리고, 제2회로부(24)는 전달게이트(22)의 출력신호 레벨에 응답하여 VPPGX의 전압레벨을 제2 글로벌 워드라인 GWLN에 전달하는 피모스트랜지스터 hp24와, 전달게이트(22)의 출력신호 레벨에 응답하여 VEEGX의 레벨을 제2 글로벌 워드라인 GWLN에 전달하는 엔모스트랜지스터 thn21을 포함하며, 피모스트랜지스터 hp24와 전류미러를 이루어 제2 글로벌 워드라인 GWLN에 안정된 VPPGX 전압레벨을 전달하기 위한 피모스트랜지스터 hp25를 더 포함한다. And, the second circuit 24 has an output signal level of the transmission gate 22, PMOS transistor hp24 and a transfer gate (22) responsive to the output signal level passes the voltage level of the VPPGX the second global word line GWLN of in response to include the NMOS transistor thn21 to pass the level of the VEEGX the second global word line GWLN, PMOS for delivering a stable VPPGX voltage level of the PMOS transistor hp24 and a current mirror made with a second global word line GWLN further comprises a transistor hp25. 상기 피모스트랜지스터 hp24, hp25는 VPPGX에 기판이 접속되며, 상기 엔모스트랜지스터 thn21은 트리플 웰(triple well)에 형성되면서 트리플 웰의 N-웰로 VCC를 인가받는다. The PMOS transistor hp24, hp25 is connected to the substrate VPPGX, the NMOS transistor thn21 is formed as the triple-well (triple well) is given the N- wells VCC of triple-well. 또한, 상기 전달게이트(22)는 RSTN 및 RSTP 제어신호를 각각 게이트로 입력받는 엔모스트랜지스터 hn21과 피모스트랜지스터 hp21로 구성된다. Also, the transfer gate 22 is composed of a RSTN and RSTP control signal to the receiving respectively the gate NMOS transistor and PMOS transistor hn21 hp21. 표 2는 상기 도 2와 같은 구성을 갖는 글로벌 로우디코더에 관한 각 모드에서의 동작을 나타낸다. Table 2 shows the operation in the respective modes of the global row decoder having a structure as shown in FIG. 2. 상기 표 2에 나타난 바와 같이 본 발명에서, 글로벌 로우디코더 입력인 VPPGX, VEEGX는 종래와 동일하고, RSTP와 RSTN은 기입모드에서 각기 OV와 VCC 레벨이고, 프로그램모드에서는 VPP와 VCC 레벨이고, 소거시에는 VCC와 VPPGX 레벨인 2V이다. 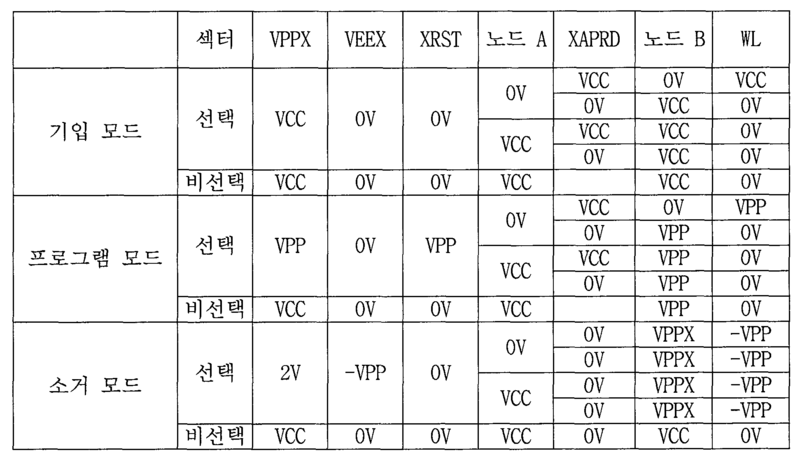 In the present invention As shown in Table 2, and the global row decoder input is VPPGX, VEEGX is the same as the prior art and, RSTP and RSTN are each OV and VCC level in the write mode, and the program mode, VPP and VCC level, the erase There is VCC and VPPGX level of 2V. 또한, 기입 및 프로그램 모드에서 선택된 글로벌 로우디코더의 노드 C는 OV이고, 비선택된 글로벌 로우디코더의 노드 C는 VCC 레벨이며, 소거모드에서는 로우어드레스 조합 중 어느하나가 비선택되도록하여 글로벌 로우디코더의 노드 C는 항상 VCC 레벨이 된다. In addition, the write-in and a node C is OV of the global row decoder selected in the program mode, the node C of the non-selected global row decoder is a VCC-level, in the erase mode node in the global row decoder to ensure that any one of the row address combination, the selection ratio C is always VCC level. 결국, 기입 모드에서는 선택된 글로벌 로우디코더 출력인 GWLP는 OV가 되고 GWLN은 VCC 레벨이 되며, 비선택된 글로벌 로우디코더 출력인 GWLP는 VCC 레벨이 되고 GWLN은 OV가된다. After all, the write mode, the selected global row decoder output GWLP is OV and the GWLN becomes the VCC level, the unselected global row decoder output GWLP becomes the VCC level GWLN becomes OV. 프로그램 모드에서는 선택된 글로벌 로우디코더 출력인 GWLP는 OV가되고 GWLN은 VPP 레벨이 되며, 비선택된 글로벌 로우디코더 출력인 GWLP는 VPP 레벨이 되고 GWLN은 OV가 된다. In the program mode is selected, the global row decoder output GWLP becomes OV GWLN is the VPP level, the unselected global row decoder output GWLP is a VPP-level GWLN becomes OV. 소거 모드에서는 글로벌 로우디코더 출력인 모든 GWLP는 VPPGX 레벨(이때 VPPGX 레벨은 2V이다)이 되고 GWLN은 OV가 된다. In the erase mode, the global row decoder output of all GWLP is a VPPGX level (this time VPPGX level is 2V) GWLN becomes OV. 하나의 글로벌 로우디코더 출력인 GWLP와 GWLN은 여러개 섹터의 로컬 로우디코더 그룹의 입력으로 사용됨과 동시에 하나의 섹터에 해당하는 로컬 로우디코더 중에서 XCPRED의 수만큼 로컬 로우디코더 입력으로 사용함으로 글로벌 로우디코더그룹은 하나 또는 2개 정도로 충분하다, 이에 의해 글로벌 로우디코더의 면적은 상당히 적다. A global row decoder output GWLP and GWLN is by and at the same time used as an input to the local row decoder group of several sectors used XCPRED local row decoder input as many as the number of from the local row decoder corresponding to a sector global row decoder group one or two is sufficient enough, whereby the area of ​​the global row decoder is considerably less. 도 3은 본 발명에 일실시예에 따른 로컬 로우디코더의 회로도로서, 그 세부 구성은 제1 글로벌 워드라인 GWLP의 신호 레벨에 응답하여 VEEX Y 의 레벨을 워드라인 WL에 전달하는 엔모스트랜지스터 thn31과, 역시 제1 글로벌 워드라인 GWLP의 레벨에 응답하여 XCPRED의 레벨을 워드라인 WL에 전달하는 피모스트랜지스터 hp31과, 제2 글로벌 워드라인 GWLN의 레벨에 응답하여 XCPRED의 레벨을 워드라인 WL에 전달하는 엔모스트랜지스터 thn32로 구성되며, 상기 엔모스트랜지스터 thn31과 thn32는 트리플-웰에 형성되고 그 트리플-웰의 각 N-웰은 VCC 레벨을 인가받는다. 3 is a circuit diagram of the local row decoder according to an embodiment of the present invention, the detailed construction is a first NMOS transistor of the level of VEEX Y in response to the signal level of the global word lines GWLP transmitted to the word line WL thn31 and , which is also the first pass to a global word lines in response to the level of the GWLP to pass the level of the XCPRED to the word line WL PMOS transistor hp31 and a second level of XCPRED in response to the level of the global word lines GWLN to the word line WL yen thn32 consists of MOS transistors, the NMOS transistor thn31 thn32 and a triple-well are formed in the triple-N- each well of the well is supplied with the VCC level. 또한, 피모스트랜지스터 hp31의 N-웰(기판)은 VPPXv의 레벨을 인가받는다. In addition, blood N- well (substrate) of the MOS transistor is supplied with a level of hp31 is VPPXv. 아래 표 3은 도 3의 로컬 로우디코더에 관한 각 모드에서의 동작을 나타낸다. The following table 3 shows the operation in the respective modes according to the local row decoder of Fig. 상기 표 3에 나타난 바와 같이, 제1 및 제2 글로벌 워드라인 GWLP 및 GWLN은 앞서 설명한 바와 같으며, VPPXy는 기입모드에서 VCC 레벨, 프로그램 모드에서 VPP 레벨, 소거 모드에서 약 2V 정도의 레벨을 갖는다. As shown in Table 3, the first and the second global word line GWLP and GWLN are as previously described, VPPXy has the VCC level, the VPP level, a level of about 2V level in the erase mode from the program mode from the write mode . VEEXy는 기입 모드와 프로그램 모드에서 OV, 소거 모드에서 선택된 섹터일 경우 -VPP 레벨 비선택 섹터일 경우 OV이다. VEEXy is OV when -VPP level unselected sector if the selected sector on the OV, the erase mode in a writing mode and a program mode. 로우 어드레스 조합 신호인 XCPRED는 2ⁿ 수 만큼 있으며, 기입모드에서 선택된 XCPRED는 VCC 레벨이고, 비선택 XCPRED는 OV이다. The row address signal is a combination XCPRED is a and the number 2ⁿ, XCPRED selected in the writing mode, VCC level, the unselected XCPRED is OV. 프로그램모드에서 선택된 XCPRED는 VPP 레벨이고, 비선택 XCPRED는 OV이다. And XCPRED VPP level is selected in the program mode, the unselected XCPRED is OV. 소거 모드에서는 모두 OV이다. In the erase mode are both OV. 결론적으로, 선택된 워드라인 WL은 기입모드에서 VCC, 프로그램 모드에서 VPP, 소거 모드에서 -VPP 레벨이 되고, 비선택된 워드라인 WL은 모든 모드에서 OV가 된다. Consequently, the selected word line WL is in the write mode -VPP level at VPP, the erase mode in the VCC, the program mode, the unselected word lines WL is the OV in all modes. 이상에서 설명한 바와 같은 로컬 로우디코더는, 기입모드에서 선택된 워드라인 WL에 원하는 전압 레벨을 인가하기 위하여 XCPRED를 소스로 사용하여 피모스트랜지스터 hp31과 엔모스트랜지스터 thn32 모두를 턴온시켜서 사용함으로 종래의 로우디코더 보다 사이즈가 작을 뿐 아니라 회로도 간단함으로 면적이 상당히 작다. Local row decoder by the word line WL is selected in write mode by using XCPRED as a source to apply a desired voltage level PMOS transistor hp31 and yen used by turning on both PMOS transistor thn32 conventional row decoder as described above as well as smaller than the size of a simple circuit by area is quite small. 또한, 피모스트랜지스터 hp31의 사이즈가 작으면서 VPPXy가 피모스트랜지스터 hp31의 N-웰에만 연결됨으로 그 만큼 VPPXy의 로딩이 줄어든다. Further, the blood flew the size of the MOS transistor connected to hp31 less VPPXy the blood only in N- well of a MOS transistor hp31 decreases the loading of as much VPPXy. 결론적으로 프로그램시 펌핑하는데 시간을 조금이나마 줄일 수 있다. Consequently, the program can reduce the time to pump some direction. 상술한 바와 같이 본 발명에 의하면 로우디코더의 면적을 줄일 수 있으며 VPP 및 -VPP의 로딩을 많이 줄일 수 있어 펌핑 시간이 적게 소요됨으로 소자의 특성을 개선시키는 효과가 있다. According to the present invention as described above can reduce the area of ​​the row decoder can be reduced, and a lot of the loading of the VPP and -VPP the effect of low pumping time improving the properties of the device as soyodoem. 도 1은 종래기술에 따른 플래쉬 메모리 로우디코더(Row Decoder) 회로도. 1 is a flash memory, the row decoder (Row Decoder) circuit according to the prior art. 도 2는 본 발명의 일실시예에 따른 글로벌(Global) 로우디코더 회로도. Figure 2 is a global (Global) the row decoder circuit according to an embodiment of the present invention. 도 3은 본 발명의 일실시예에 따른 로컬(Local) 로우디코더 회로도. 3 is a local (Local) The row decoder circuit in accordance with one embodiment of the present invention. 상기 전달게이트부의 출력 레벨에 응답하여 상기 VPPGX 전압레벨과 VEEGX 전압레벨을 선택적으로 제2 글로벌 워드라인에 전달하는 제2 회로수단을 포함하는 플래쉬 메모리 장치의 로우디코더. A row decoder for a flash memory device including a second circuit means in response to the transfer gate portion output level VPPGX the voltage level and the voltage level VEEGX optionally passed to a second global word line. 상기 제1 엔모스트랜지스터(hn22) 및 제1 피모스트랜지스터(hp22)로부터 전달된 전압레벨에 응답하여 상기 VPPGX 전압레벨을 제1 글로벌 워드라인으로 전달하는 제2 피모스트랜지스터(hp23)를 포함하는 플래쉬 메모리 장치의 로우디코더. And the first en response to the voltage level delivered from the MOS transistor (hn22) and a first PMOS transistor (hp22) and a second PMOS transistor (hp23) transferring the VPPGX voltage level in a first global word line a row decoder for a flash memory device. 상기 전달게이트부의 출력 레벨에 응답하여 상기 VEEGX의 전압레벨을 상기 제2 글로벌 워드라인에 전달하는 제2 엔모스트랜지스터(thn21)를 포함하는 플래쉬메모리 장치의 로우디코더. A row decoder for a flash memory device and a second NMOS transistor (thn21) in response to the transfer gate section to a voltage level of the transmission output level VEEGX to the second global word line. 상기 제3 피모스트랜지스터(hp24)와 전류미러를 이루어 상기 제2 글로벌 워드라인에 안정적으로 상기 VPPGX 전압레벨을 전달하기 위한 제4 피모스트랜지스터(hp25)를 더 포함하는 플래쉬 메모리 장치의 로우디코더. The row decoder of the third PMOS transistor (hp24), and the flash memory device to the fourth PMOS transistor further comprises a (hp25) a current mirror made of the second to deliver a stable manner the VPPGX voltage level to the global word lines. 상기 제3 및 제4 피모스트랜지스터(hp24, hp25)는 상기 VPPGX의 전압레벨을 기판에 인가받고, 상기 제2 엔모스트랜지스터(thn21)는 트리플 웰(triple well)에 형성되면서 트리플 웰의 N-웰로 공급전압 레벨을 인가받는 플래쉬 메모리 장치의 로우디코더. The third and fourth PMOS transistor (hp24, hp25) is being applied to the voltage level of the VPPGX to the substrate, the second NMOS transistor (thn21) is of the triple-well formed as the triple-well (triple well) N- the row decoder in the flash memory device is receiving a supply voltage level wells. 상기 입력수단은 프리디코더로부터의 출력신호 XBPRED 및 XAPRED를 2입력으로하는 낸드조합수단을 포함하는 플래쉬 메모리 장치의 로우디코더. A row decoder for a flash memory device that said input means comprises means for combining an output signal of NAND XBPRED and XAPRED from the predecoder to the second input. 상기 전달게이트부는 제어신호 RSTN 및 RSTP을 각 게이트로 입력받는 제3 엔모스트랜지스터(hn21)와 제5 피모스트랜지스터(hp21)를 포함하는 플래쉬 메모리 장치의 로우디코더. The transfer gate control signal RSTN portion and a row decoder for a flash memory device comprising a gate for receiving a respective third NMOS transistor (hn21) and the fifth PMOS transistor (hp21) the RSTP. 상기 VEEGX 전압레벨은 기입 및 프로그램모드에서 상기 접지전압 레벨을 갖고 소거 모드에서 상기 네거티브 펌핑 전압 레벨을 갖는 플래쉬 메모리 장치의 로우디코더. A row decoder for a flash memory device having the negative pumped voltage level at the erase mode has the ground voltage level, the voltage level in the write VEEGX and program mode. 상기 제어신호 RSTP는 기입 모드에서 상기 접지전압 레벨을 갖고 프로그램 모드에서 상기 포지티브 고전압 레벨을 가지며 소거 모드에서 상기 공급전압레벨을 갖는 플래쉬 메모리 장치의 로우디코더. The control signal RSTP is a row decoder for a flash memory device having the supply voltage level in the erasing mode has the positive high voltage level at the ground voltage level has a program mode in a writing mode. 상기 소정전압 레벨은 약 2V인 플래쉬 메모리 장치의 로우디코더. Row decoders of the predetermined voltage level is about 2V in the flash memory device. 상기 제2 글로벌 워드라인 신호에 응답하여 XCPRED 전압 레벨을 상기 워드라인에 전달하는 제3트랜지스터(thn32)를 포함하는 플래쉬 메모리 장치의 로우디코더. A row decoder for a flash memory device including a third transistor (thn32) for the second pass the global word lines in response to a signal XCPRED voltage level to the word line. 상기 제1 및 제3 트랜지스터는 각각 엔모스트랜지스터이며, 상기 엔모스트랜지스터는 트리플 웰(triple well)에 형성되면서 상기 트리플 웰의 N-웰로 공급전압 레벨을 인가받는 플래쉬 메모리 장치의 로우디코더. It said first and third transistors are NMOS transistors, respectively, the NMOS transistors are triple well (triple well) as the row decoder in the flash memory device is receiving a supply voltage level of the N- well of triple well formed. 상기 제2 트랜지스터는 피모스트랜지스터이며, 상기 피모스트랜지스터는 자신이 형성된 N-웰에 VPPXy 전압 레벨을 인가받는 플래쉬 메모리 장치의 로우디코더. The second transistor is a P MOS transistor, the PMOS transistor is a row decoder for a flash memory device is receiving the voltage level on VPPXy N- well they are formed. 기입 및 프로그램 모드에서, 상기 제1트랜지스터는 비선택된 글로벌 로우디코더의 상기 제1 글로벌 워드라인 신호를 입력으로할 때 턴-온되어 상기 VEEXy 전압 레벨을 상기 워드라인에 전달하며, 상기 제2 및 제3 트랜지스터는 선택된 글로벌 로우디코더의 상기 제1 및 제2 글로벌 워드라인 신호를 입력으로 할 때 턴-온되어 상기 XCPRED 전압 레벨을 상기 워드라인에 전달하는 플래쉬 메모리 장치의 로우디코더. Write-in and the program mode, the first transistor is turned on when the first global word line signal of the non-selected global row decoder as an input - is turned on, and transfer the VEEXy voltage level to the word line, the second and third transistor is turned on when the first and second input signals to the global word line of the selected global row decoder is a row decoder on the flash memory device to transfer the XCPRED voltage level to the word line. 소거 모드에서, 상기 제2 및 제3 트랜지스터는 턴-오프되고, 상기 제1트랜지스터는 턴-온되어 상기 VEEXy 전압 레벨을 선택된 섹터의 모든 워드라인에 전달하는 플래쉬 메모리 장치의 로우디코더. In the erase mode, the second and the third transistor is turned off, the first transistor is turned on, the row decoder in the flash memory device to pass on all of the word lines of the selected one of the voltage level VEEXy sector. 상기 XCPRED 전압 레벨은 소정 어드레스 조합으로써 다수개로 이루어지며, 기입모드에서 선택된 XCPRED는 공급전압 레벨이고 비선택 XCPRED는 접지전압 레벨이며, 프로그램모드에서 선택된 XCPRED는 포지티브 고전압 레벨이고, 비선택 XCPRED는 접지전압 레벨이며, 소거 모드에서는 모두 접지전압 레벨을 각각 갖는 플래쉬 메모리 장치의 로우디코더. The XCPRED voltage level is made of multiple pieces by a predetermined address combination, XCPRED selected in the write mode, the supply voltage level and the unselected XCPRED is a ground voltage level, XCPRED selected in the program mode is a positive high voltage level, the unselected XCPRED is a ground voltage level, and all of the row decoder in the erase mode of the flash memory device having a ground voltage level, respectively.